A tentative contract agreement has been approved by Spokane Police Guild members and will be made public later today in a press conference led by Mayor Condon. The Inlander obtained an advance copy of the agreement and it confirms what oversight advocates have been saying for the past month: The proposed contract does not include independent investigative powers for the ombudsman — despite the fact voters overwhelmingly passed an amendment to the City Charter this year granting the ombudsman such authority. The secret, closed-door negotiations over the past 21 months have been a source of city council frustration and drawn outcry from local accountability groups. The agreement will now go to the city council, where several members — as well as candidates vying for a seat in next week's election — have called for a stronger ombudsman. When negotiators first reached a tentative agreement in early October, Councilman Steve Salvatori sought advice from local legal nonprofit the Center for Justice about whether the then-confidential agreement empowered the ombudsman to the extent called for in the citizen-approved amendment. Center representatives have since said publicly that they do not believe the agreement goes far enough. Salvatori had led a push to expand powers for the Office of Police Ombudsman outside the contract negotiation process, but amid a flurry of news that an agreement was forthcoming, he and other council members effectively gutted his ordinance. Indeed, the language about civilian oversight (Article 27) in the tentative agreement is largely similar to that in the city's 2010-2011 agreement with the guild. The ombudsman's investigations are still part of the police department's internal affairs process (he can observe, ask questions and create closing reports). The primary difference is that if the ombudsman is unsatisfied with an internal affairs investigation, the final say on whether the internal affairs department must reopen an investigation falls to the newly created Office of Police Ombudsman Commission — instead of leaving the decision to the mayor. It's still unclear who exactly will make up the commission, but it's expected to include at least two members nominated by the mayor and three by the council. That the agreement does not explicitly allow the ombudsman to open his own investigations underscores the difference between how the administration and advocates view state law and the ombudsman system in place. "The IA investigator is here, and sitting right here next to him or her is the [ombudsman]," Police Chief Frank Straub told the Inlander Thursday afternoon. "You have the representative of the people who sits in on every internal affairs interview." "Now that independence goes the next step," adds Mayor David Condon, "which is they report to the commission, so you take it out of the mayor's hands and [to] the commission then and the citizens are represented by that commission. That's a pretty significant independence to say the least." Not significant enough, says Center for Justice Executive Director Rick Eichstaedt, whose group has pushed for an ombudsman office that can open its own investigations. "The ombudsman is to a large extent at the whim of the IA process," he says. "[IA investigators] can drag their feet." City staff and citizen legal advocates like those at the Center for Justice have clashed over whether the city has the authority to empower the ombudsman beyond what the new agreement allows. The city has long held that it can't do so because of state labor law limits. Eichstaedt and others say they believe the city can empower the ombudsman further as long as the investigations he's allowed to conduct don't result in officer discipline. To supplement the contract agreement, city council members have touted an ordinance they'll pass alongside the agreement to further specify the authorities of the ombudsman and the commission. Council Members Salvatori, Nancy McLaughlin and Jon Snyder have been leading meetings to hash that out. After meeting with Eichstaedt, local civil rights attorney Breean Beggs and city, police department and guild representatives, the group planned to release the ordinance this week. But after the latest meeting on Tuesday, discussions fell apart. "I only found out three hours ago that we're farther away than I thought we were," Salvatori told the Inlander late Thursday. "We'll work [the disagreements] out. We need everyone's reservations on the table at the same time in the same meeting so we can deal with them." Some present at the meetings say the guild's lawyers have raised concerns since the Tuesday meeting about disagreements over who should be on the OPO commission and who should select the ombudsman himself. 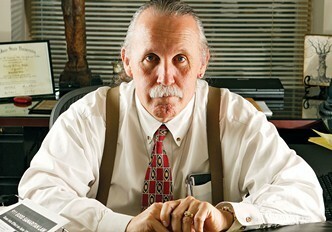 Spokane Police Guild President John Gately dismisses the idea that the guild's concerns alone are behind the delay. "I don't think it's ready because it has a lot of moving parts to it," he says. "Hammering it out in two meetings is not realistic." Further highlighting the chasm: Gately says his group believes the ordinance being discussed is only meant to address the commission, not the authority of the ombudsman office. Others would like to see the ordinance empower the ombudsman beyond what's in the contract agreement. "We can't help the fact that somebody screwed up in negotiating this agreement," says Eichstaedt with the Center for Justice. "There needs to be independent, nondisciplinary investigations. There's a lot of flexibility in discussion for the specifics of that." Another oversight issue in the agreement: body cameras. Suggested by the Use of Force Commission, the department allocated the money for the purchase of body cameras for every Spokane Police officer in uniform earlier this year. The agreement acknowledges that SPD will use body cameras, but leaves the creation of policy for just how they'll be used (privacy regulations, length of time videos will be stored, etc.) to the department. 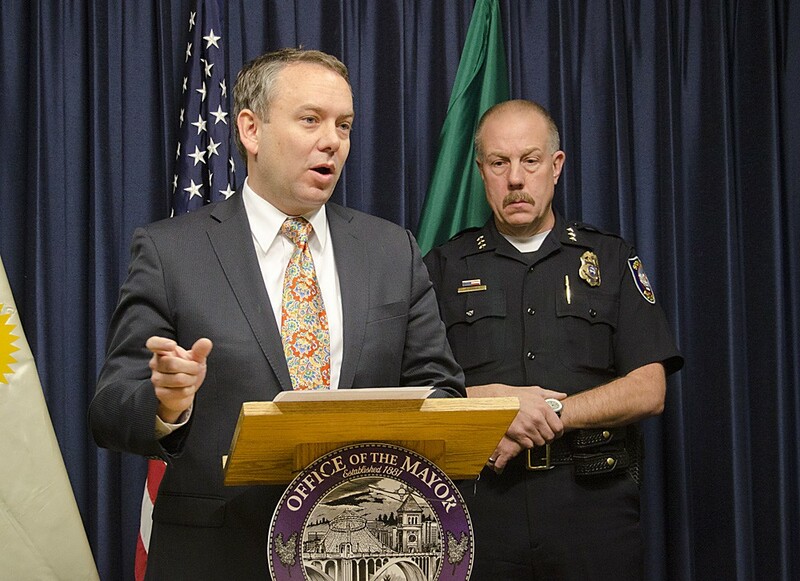 Mayor David Condon, left, and Police Chief Frank Straub at the press conference this morning. UPDATE: The mayor and police chief released the tentative agreement to a small group of reporters at City Hall this morning, describing it as a step toward enhancing police oversight, despite its lack of any language allowing the ombudsman to open his own investigations. "Citizen oversight continues through the current OPO and it will be enhanced as we go forward in this process," Mayor David Condon said. He acknowledged hopes that an ordinance would also come forward today, which would have specified the exact details of the future of the ombudsman in light of February's citizen-approved charter amendment. "I am disappointed today that we aren't able to talk today about bringing together a final draft [of an ordinance] although at the same time I'm excited about the process that is being led through the council and many of the stakeholders in our community," he said. Despite frustrations from the City Council and public over the closed-door process the city and guild agreed to prior to contract negotiations, Condon described it as an "open process." Along with oversight and body cameras, the agreement specifies a 2 percent-per-year pay increase for guild members through 2015 and changes to health benefits. At the press conference, the city also released a legal analysis from a Seattle-based firm called Summit Law Group, explaining why it believes the city is limited in how much it can empower the ombudsman. Find that document at the bottom of this post. Public forums to discuss the TA and future ordinance are scheduled for Nov. 13 at City Council Chambers, Nov. 20 at the West Central Community Center and Dec. 4 at the Northeast Community Center. UPDATE: The City Council has now made its current draft of the ordinance public on the city's website. As it stands, the ordinance would allow the ombudsman to open separate investigations as long as they are nondisciplinary. But as city, citizen and guild representatives continue to discuss specifics, it's unclear whether that will remain in the ordinance. Find the full draft ordinance at the bottom of this post.